Community or civic engagement includes service learning courses and other experiential learning such as internships and applied research projects. In general, civic engagement is the collaboration between members of the community and students, faculty, and/or staff members. Representatives from the community and SPIA mutually decide which issues will be studied and/or what activities will be performed to help solve selected problems. Community engagement enhances student learning by putting into practice the knowledge and skills acquired in the classroom. Applied research projects allow students to apply the knowledge and skills developed during their studies to help solve real world problems. Typically, students meet with leaders of an organization or community to understand their needs, then mutually agree upon a project that will provide the organization or community with research needed to affect positive change. Courses offered by SPIA that require students to conduct applied research projects are guided and supported by the course instructor. Service or volunteering is part of the SPIA culture. Our faculty, staff, and students frequently serve as volunteers in our region in a wide variety of ways—from serving on boards and committees to offering expertise to help neighborhoods and organizations when in need. Students enrolled in service learning courses offered by SPIA engage with and learn from the community as events, programs, and activities are taking place. Service learning allows students to see and practice what they have learned in the classroom. 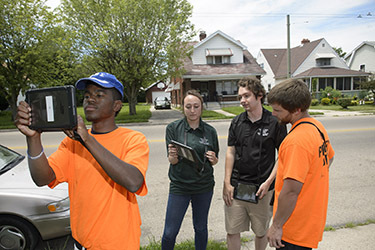 Wright State’s Office of Service Learning and Civic Engagement supports and frequently coordinates service learning and other forms of community engagement. The community service performed by SPIA and other units across campus have earned Wright State recognition from the Carnegie Foundation for the Advancement of Teaching for being an institution advancing student learning through community engagement.